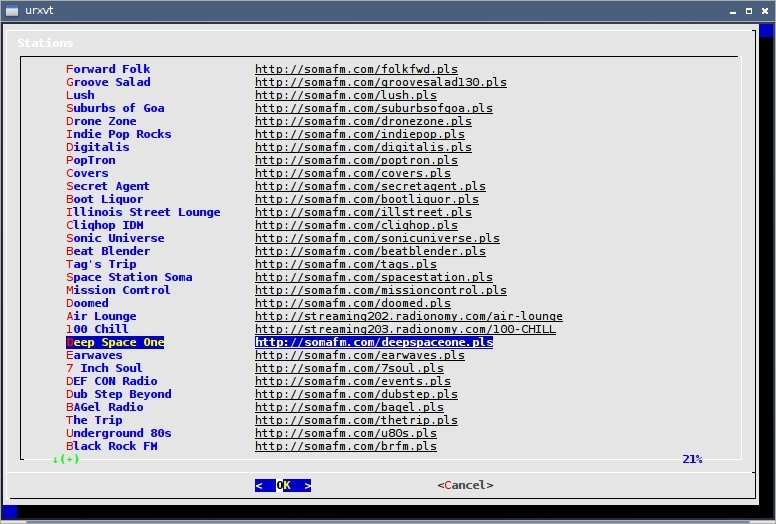 Waaay back in November, I got an e-mail from Peter mentioning soma, a text-only streaming audio tool. I diligently shuffled it away until the S section, and now I wish I hadn’t. This is what I really like to see in console applications: Use the tools that are available. Add a dash of customizability. Keep things clean and straightforward. Don’t sell the console short. Allow for others to adjust as needed. soma, as far as I can tell, really only relies on dialog to handle the interface, and mplayer to do the actual playback. soma has some hotkeys and some keystrokes to control volume and playback, and almost everything else is menu-driven. 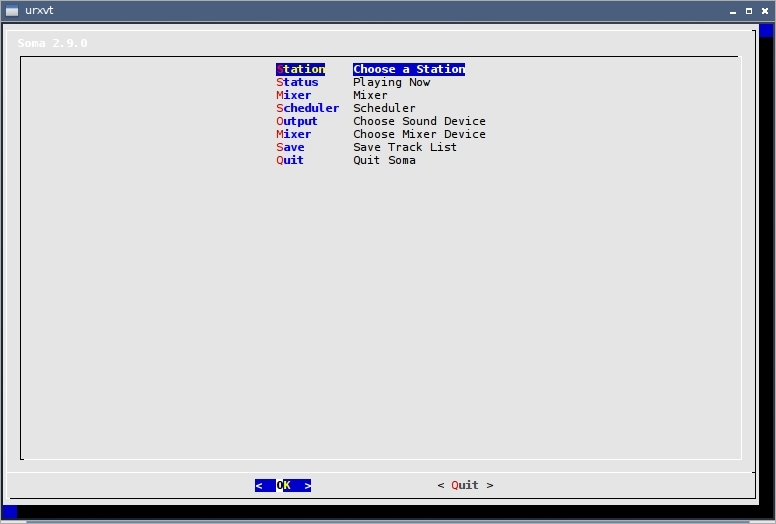 Check out the Scheduler options; that’s a rather good idea to have in an audio player. I’m surprised more don’t. I don’t see soma in Arch/AUR, or Debian for that matter, but the developer appears to have bundled it for Slackware — so it’s not quite a free-roaming program. If you have a burning desire to try it out, I decided on the quick-and-dirty way of making it work, by copying the three configuration files to ~/.soma and to /etc/soma (otherwise soma spits out errors) and running it from its unpacked folder, just as ./soma should do it. 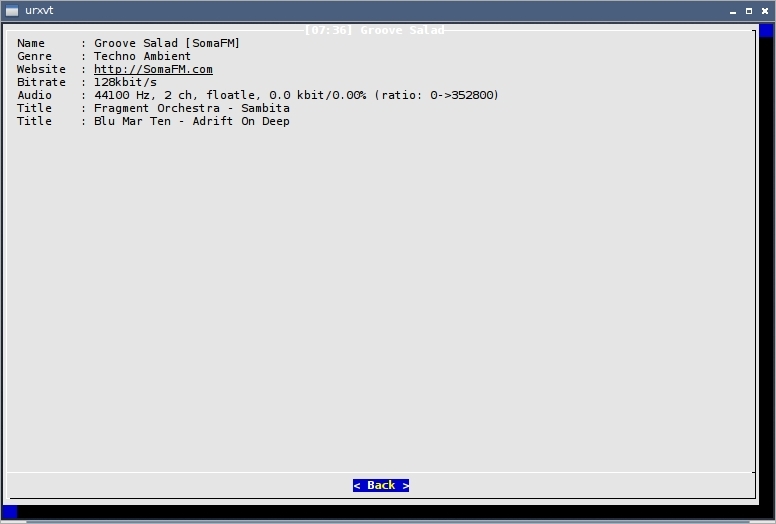 I didn’t work with it long enough to get the Mixer or Output options working smoothly; on my system I have only one basic sound card, and I use Openbox’s hotkeys to spawn alsamixer anyway. If you get them configured, let me know how you did it. I might take some time later today and try to put together a proper PKGBUILD; as luck would have it I’m bogged down with real-life commitments for most of the day, and this is going to be a busy week for me. This entry was posted in Linux and tagged audio, cd, music, stream, streaming on 2014/05/04 by K.Mandla.